Readers will be aware that Anglo Irish Bank was nationalised in January 2009. This came after the bank guarantee scheme of September/October 2009. Anglo became a prescribed body under the Ethics in Public Office Act last summer, which was expanded through a statutory instrument in February 2010 to cover many subsidiaries of the bank. However, Anglo has not become a prescribed body under the Freedom of Information Act 1997/2003. This would require the signature of Finance Minister, Brian Lenihan. Given the sheer volumes of public money already given to the bank, and the volumes of public money due to be given, it is outrageous that the public has no recourse to information as to how this money is being spent. We cannot quantify expenditure by the bank, nor has the Government made any effort to inform the public about how much public money has been given to the banks, and how it is exactly spent. I gave a great deal of thought to this problem over the last number of months, and decided on a course of action that will be unknown to many. I have decided to publicise this process in the hope that others will follow. We have a right to know what is going on. As a result I started a process that I believe is the most significant and important request for information we have sent to date. Readers may recall a blog post I wrote back in December detailing my dealings with the Department of Arts, Sport and Tourism (DAST). After gleaning information from the footers of Ken Foxe’s FOIs concerning John O’Donoghue, I established that the Department was using Oracle iExpense software to store expenses information. I wrote an FOI request in October asking for a ‘datadump’, of the entire database since inception (in other words, a copy of the database). The Department refused both the original request and the appeal for internal review (conducted by a more senior official in the Department). In January I appealed the decision to the Office of the Information Commissioner. The request, internal review and appeal have cost a combined €240 (kindly made available by you, the public). Today I am pleased to say that I have reached a settlement with the Department, brokered by the Office of the Information Commissioner. The Department have agreed to release almost the entire database, with some elements removed. This is not a formal decision of the Commissioner, but is instead a settling of the issue. This just means that a formal OIC Decision was not required as the two parties reached an agreement. Description,	Grade,	Full Name,	Claim, Date,	Purpose,	Status,	Total Claimed,	Distribution Line Number,	Start Date, Expense Type,	Euro Line Amount,	Currency Code,	Currency Rate,	Amount	Quantity	Unit,	Rate	Net Total, (EUR)	Payment Date,	Withholding Amount	Invoice, Amount,	Amount Paid. Cost Centre numbers, employee cost centre numbers, named approvers and justification fields have been removed. There are also some removals from other fields which is either considered personal information or information obtained in confidence. These removals do not mean the information is redacted per se, it just means that in order to get the data, I agreed to remove certain columns in order to expedite the process. It does not preclude me from seeking the justification field, for example, in the future. The data contains €774,882.29 of expense claims by named civil servants over a five year period (2005 to 2009 inclusive). The amount involved might appear relatively small, but it is the quality of the data that is more significant. I cannot overstate the importance of the release of this data, and there are a number of reasons why this is the case. Firstly, it sets an important precedent in terms of what information can be obtained from public bodies. In their refusals to release this data, the Department cited three sections of the Act which they felt exempted them from releasing it. The OIC felt differently. While not a formal decision of the OIC, a settlement was justified in this case as the Department were amenable to releasing the majority of the data sought. Decisions can take far longer to get (up to two years), so I felt that on balance the offered information in the settlement was acceptable. Second, are the broader implications. Following this settlement with DAST, I have started the process of requesting similar expenses data from the Department of Agriculture and Food, the Department of Communications, Energy and Natural Resources, the Department of Community Rural & Gaeltacht Affairs, the Department of Defence, the Department of Education and Science, the Department of the Taoiseach, the Houses of the Oireachtas Commission, the Department of Justice Equality and Law Reform, the Courts Service, the Industrial Development Authority, the Department of Enterprise, Trade and Employment, the Department of the Environment Heritage and Local Government, the Department of Finance, the Department of Foreign Affairs, the Department of Health and Children, the Department of Social and Family Affairs, the Department of Transport, the Health Service Executive, the Revenue Commissioners, FÁS and Enterprise Ireland. I believe the combined expenses data for these (and other) bodies will run to tens, if not hundreds of millions of euro. But perhaps most critical is this: I sought the data not as a journalist looking for a scoop, not as a member of the public with an axe to grind, but as a transparency advocate only interested in the public interest. By publishing this, and coming data, I believe the public is served by a more open and accountable State – where data related to how some public monies are spent is no longer hidden, but is in full view. Transparency keeps the system honest. I should also make clear that publishing this data is not an attempt to embarrass any one person, nor does it form the basis of any claim that somehow there was something unjustified about any expense claimed by civil servants. It is simply an exercise in transparency, and no more. And I will leave readers with one question. If I am getting this data and intend publishing it in its entirety online for the public to see, what is stopping the Government from doing the same, proactively, without question, and as a matter of course? In the end, sunlight benefits us all. Frances Fitzgerald (Fine Gael): It is the Jack and Jill Children’s Foundation. Dominic Hannigan (Labour): Jekyll and Hyde is something different. Donie Cassidy (Fianna Fail): My apologies. It is the Jack and Jill Children’s Foundation…. Your tax euros hard at work there. Cowen to appear for bank inquiry? You would have to wonder whether you could call the proposal for a bank inquiry an ‘inquiry’ at all. It certainly does not appear to have much in the way of grilling the people who caused the mess, or of dealing with the decisions post September 2008, all of which were the critical ones. Brian Cowen, at least, is a start. But Bertie Ahern, being the Taoiseach who oversaw the entire period would be another must see. And Messrs McCreevy (Finance), Cullen, Dempsey, Roche and Gormley (Environment) would be others. As I said to Mr Boyle, accountability behind closed doors is not accountability. Accountability must be seen to be done, a bit like justice. Getting a report at the end of a process is not enough. But then accountability seems to be a rather novel concept to most of our politicians. 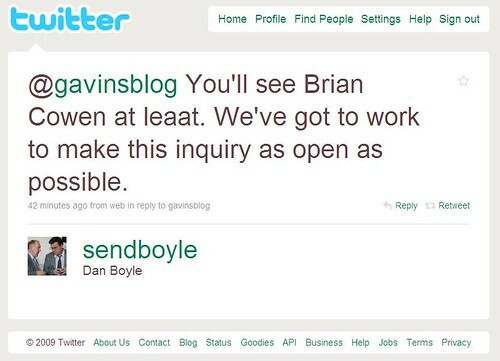 Author Gavin SheridanPosted on 1st February 2010 10th December 2015 Categories Irish Politics4 Comments on Cowen to appear for bank inquiry? I have received copies of all financial support given by Enterprise Ireland for 2005, 2006, 2007 and 2008. It details tens of millions of euro worth of grants to companies throughout the country. The supports are broken down by county. is’ and is based on PDFs which have been imported into Google spreadsheets. You can view each year of data by clicking the respective year at the bottom of the spreadsheet. (1) All transcripts of public sittings of the Moriarty Tribunal from its inception to the date on which this request is received. (2) The contract for transcription services and a breakdown of fees charged for transcription services. (3) The breakdown of fees for the maintenance and building of the Moriarty Tribunal website, and the contract for this. Today I received the reply. I had to read it twice to let it sink in. I can, in some way, live with the fact that the taxpayer spent the bones of €1 million on transcription fees since the inception of the Tribunal in 1998. But I cannot fathom how a) the transcripts are not available online and b) that I have to pay (again) to see the transcripts of the Tribunal and c) that Doyle Court Reports retains copyright on transcripts of public sittings of a Tribunal of Inquiry setup by the Department and paid for by the Irish people. I called Doyle Court Reporters this morning and they were very courteous and helpful. I asked for a quote as to how much I would have to pay for digital (.doc) copies of all 370 days of public sittings of the Moriarty Tribunal. They called me back a short time later, stating that for all days the cost would be €16,600 @ €45 per day. But if I was bulk buying they would be prepared to offer a discount of 25%. I did suggest to DCR that since the public had already paid nearly €1 million for the transcripts, it seems a little odd that I would, as a citizen, have to fork out another €16,600 to get copies of the transcripts. DCR were again courteous and helpful, and suggested I speak with the Moriarty Tribunal. I then called the Moriarty Tribunal, where I spoke with the registrar, Siobhan Hayes. First I asked if the Tribunal had copies of all transcripts, to which the answer was yes. Are these subject to FOI I then asked… to which she eventually replied no, and that copyright was with DCR. I then asked why other Tribunals, such as Mahon and Morris, had published transcripts on their websites, and Moriarty ones were unavailable. I was told that the original agreement was that copyright would stay with DCR, and that was the way it was. I then asked for a copy of the contract or agreement between the Tribunal and DCR in relation to stenography services. Siobhan said she would get back to me on this issue. Of course a couple of questions arise. First is whether the Department of the Taoiseach does hold the transcripts, but simply pointed me in the direction of Doyle Court Reporters for copies of them. Second is how, exactly, copyright on transcripts of a public sitting of a Tribunal applies. Third, and most importantly, is why the transcripts are unavailable for public consumption as a matter of public record. These are historically important transcripts containing the sworn evidence of former Taoisigh including Charles Haughey and Bertie Ahern, as well as other former senior ministers, civil servants and businessmen, all in relation to extremely serious issues of public concern. Indeed when a Tribunal is established it is invariably included in the Terms of Reference that it concerns “definite matters of urgent public importance”. Yet in relation to a matter of urgent public importance, for a Tribunal that is shortly to issue its second and final report, I can’t see who said what in relation to anything on any given day, whatsoever. I don’t want this post to seem like an “I told you so” post. But it might appear that way. I started irishcorruption.com/publicinquiry.eu back in 2005. One of the biggest issues myself and my uncle Anthony covered, and still cover on that blog, is the lack of regulation of the banks. And when the country was in a credit boom, and nobody, or at least very few, were asking questions about regulation of the banks, myself, and to a much deeper degree Anthony where highlighting this issue ad nauseum. Almost all of these posts were also copied to the office of the Financial Regulator. August 21, 2007 Dublin – A conduit for dodgy deals? And that’s just the first two years of blog posts. Never let anyone tell you that no one could have seen what was coming. Two good articles by IT journalists over the weekend. THE INTERNATIONAL Monetary Fund (IMF) told the Government that the definition of “long-term economic value” on bank loans in the draft Nama Bill was “masterful” as it was “sufficiently specific” and “sufficiently vague” to allow “appropriate flexibility”. Steven Seelig, an adviser at the IMF, made the comments in an e-mailed response to a request by the Department of Finance for his opinion on the draft National Asset Management Agency Bill published last August. “It is both sufficiently specific and sufficiently vague to allow appropriate flexibility. I hope you can retain this language,” said Mr Seelig, an expert on “bad banks”, in a private e-mail to department officials sent on August 25th. The e-mail was among records released to The Irish Times under the Freedom of Information Act relating to representations made to the department on Nama. THE NATIONAL Asset Management Agency (Nama) should be required to register with the Land Registry or the Registry of Deeds, Minister for Finance Brian Lenihan has been advised. In correspondence released to The Irish Times under the Freedom of Information Act, the Law Society of Ireland and the Property Registration Authority both expressed concern about the exemption for Nama assets to register in the Land Registry or the Registry of Deeds. The society wrote to Mr Lenihan in September to say “normal conveyancing practice” should not be disrupted by Nama and that the agency should be required to register its interest in a land bank or property title. The Property Registration Authority said the exemption for Nama assets to register “would appear to run counter to public policy and the necessity of transparency and reliability in land registers”. Registration on a State register “provides clarity and certainty”, John Coleman, chairman of the Property Registration Authority, wrote to the Department of Finance. Other letters written to Mr Lenihan expressing concerns about the workings of Nama included a note from Bernard Allen TD, chairman of the Committee of Public Accounts. I will be seeking copies of these FoI in my own future FoIs.